Vaccines are the most cost-effective healthcare intervention. Yet, although basic in western societies, vaccines are still largely unavailable in poorer nations. Vaccines are difficult to transport, because they lose their effectiveness if not kept within close temperature limits. So, health clinics struggle to vaccinate effectively the remote and sparse populations in places such as the Kangchenjunga region. In response to this problem, KSP proposed that a network of solar-powered and wind-powered vaccine fridges, installed in strategic locations, could provide a workable system for delivering effective vaccines to remote populations. From the fridges, the vaccines would be hand carried in insulated containers to where they would be administered. KSP launched this project by installing a fridge at the Lungthung health post. This first fridge was a trial. If it proved effective � as it has � further fridges would be installed. Now, KSP has a network of seven fridges. Delivering and installing the first vaccine fridge showed just how much effort can be required in a charity program. The fridge was purchased in February 1999, tested in California for a month, then air-freighted to Nepal. 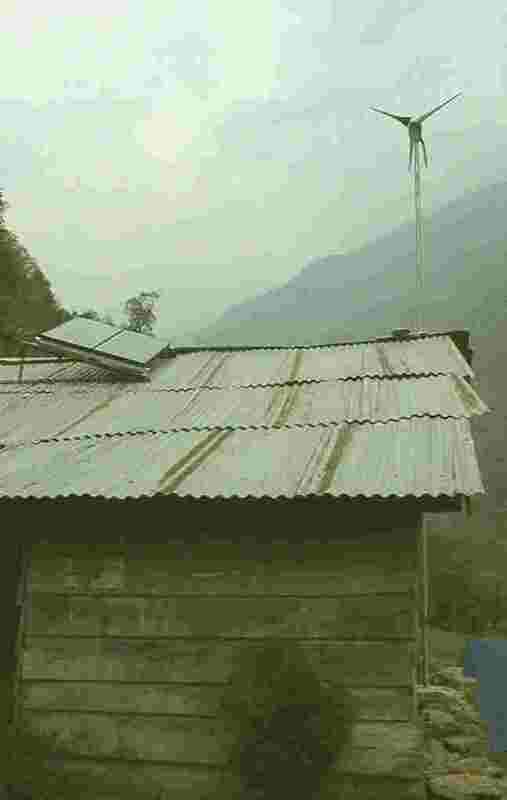 In April, four KSP volunteers flew to Nepal, taking with them solar panels and a wind generator. They transported the fridge to Taplejung by truck, a 48-hour, dusty drive from Kathmandu. Three Sherpa porters then carried the fridge, which weighed over 200 lbs, to the health post in Lungthung. Working in 10-minute shifts, for three days, this was no small feat, but the fridge arrived undamaged. The journey from Kathmandu had totalled nine exhausting days. Mr Tek Bahadur Rai, found space for the fridge in his crowded health post, and a table was constructed for it using local labor and materials, so that access to the vaccines would be at eye level. Then, the solar panels and the wind generator were installed on the health post�s roof, using a frame of slotted angle iron. Finally, the two �solar deep cycle� batteries, purchased in Kathmandu, were filled with acid, and the fridge was switched on. To everyone's amazement, it worked! There was ice in the freezer by the end of the second day. See also, Technical report on installation of vaccine storage refrigerator at Lungthung health post, East Nepal. Since installation, the fridge has worked well (despite being moved to Lelep in 2005 – see TREK REPORT 2005), and local children are being vaccinated. Vaccines are provided by the World Health Organisation, through the Government of Nepal. The combination of solar and wind power is proving effective. The solar panels provide most of the power to charge the batteries, but are augmented by the wind generator during the winter months when the solar panels are less effective. Apart from checking the battery-acid level each month and topping up the acid with rain water when necessary, no maintenance should be required for at least two years. The batteries and wind generator are expected to last 10 years, and the solar cells 30 years, much longer than the structure of the health post is likely to survive. Following the success of the Lungthung fridge, the District Health Officer asked KSP to install six more fridges in remote locations in the Taplejung district � Hangpang, Sablakhu, Sadewa, Tellok, Manankhe, and Masring. Agilent Technologies generously agreed to fund the project, and the fridges were installed in November and December 2000. These fridges are at lower altitudes and are powered by solar panels alone. Aim: To make viable vaccines available in remote locations. ing six were sponsored by Agilent Technologies and installed by Lotus Energy, Kathmandu. Lotus Energy also visited the fridges twice (six months apart) for maintenance purposes. 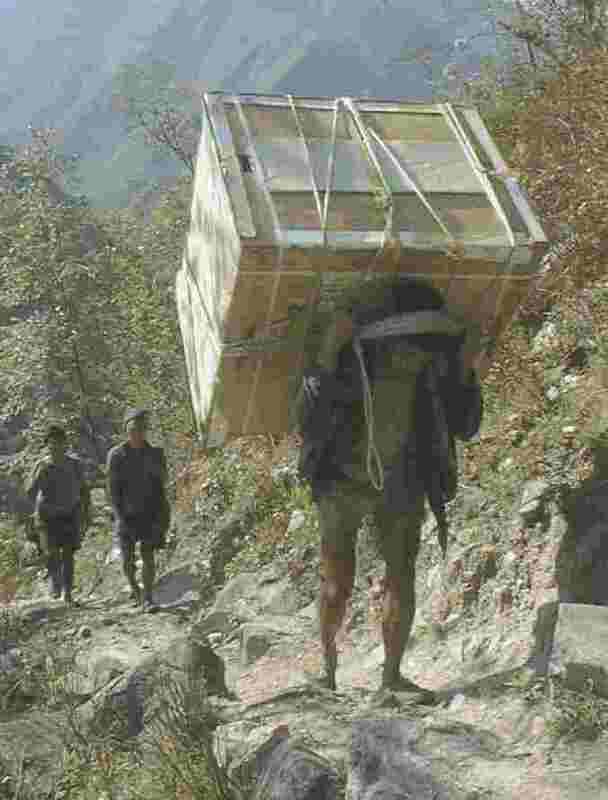 Three porters carried the 200lb fridge for three days, taking turns every 10 minutes. 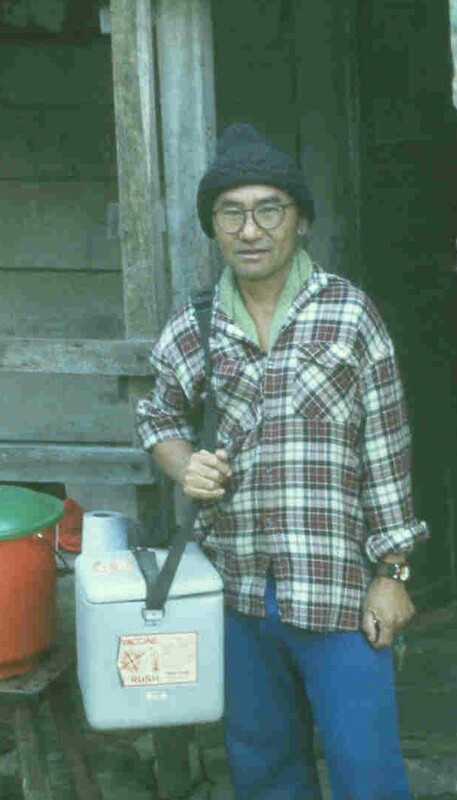 Healthcare worker, Tek Bahadur, using a cool box to carry vaccines from the fridge to where they will be administered.